I'm so excited that October is here! It is my favorite month! Maybe it is because the weather is getting cooler, so I can wear my boots and sweaters again. Maybe it is because the trees are changing color. Or maybe it is because my son and I celebrate our birthdays (and have an awesome party of course!). But since it is October, that means it is time for another currently! I always like to drink a cup of coffee and listen to the news early in the morning. But my dog has a skin condition that flares up in the fall and in the spring. I'm going to the pet store later today to see if I can get something for him...poor thing! It is so easy to get caught up with all of the bad things in life, because let's face it, there is a lot of bad stuff that happens. But there are also so many good things, big and small, that happen on a daily basis. So I'm going to start a journal and write things I am grateful for on a daily basis. I think it will help reframe my thinking, and be a positive step in the right direction. I'm wanting the weekend to arrive. This has been a terrible week for my family, and I'm just thankful the weekend is close, and we can finally relax and be together. Since I've been out of town for a week, I have several errands to run - the bank, the post office, grocery store. Oh yeah, and the house needs to be cleaned too! Treat - Have you checked out the dollar tree for decorations or small student gifts? There is so much stuff in there (and everything is only $1!!). 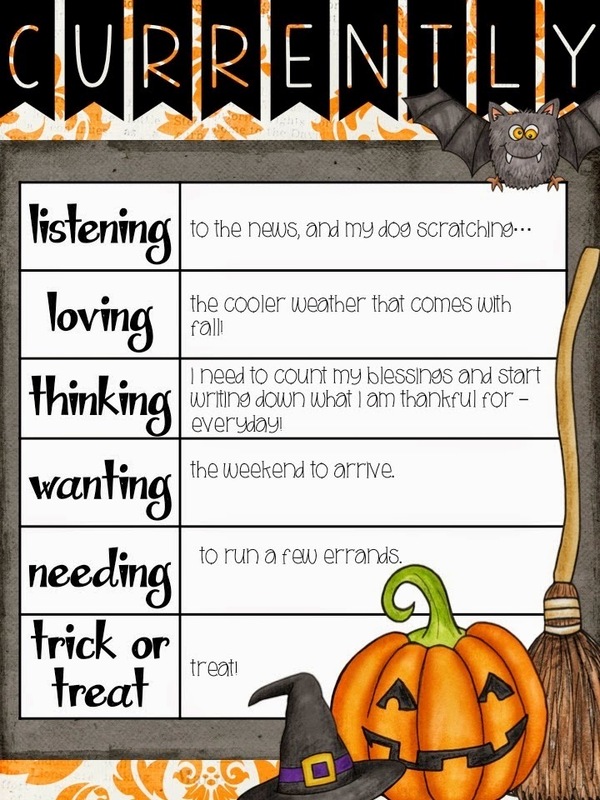 If I still had my classroom, I would definitely buy some decorations, and maybe some gifts (I know some students don't celebrate Halloween, but everyone appreciates a cute gift!). Sorry that your family had a bad week- enjoy the weekend and regroup. I too need to start a Thankful journal because it is easy to lose sight of all the good things that we have. Thanks for stopping by my blog! Have a great October! Great idea about starting a journal about all the good things that happen! I'm thinking that I need to do that with my students or something that turns their minds toward good things!